Main | The Fourteenth Amendment: What Norms Did 'We the People' Establish? Welcome to the Originalism Blog -- the Blog of the Center for the Study of Constitutional Originalism at the University of San Diego School of Law. At the Originalism Center, we have followed with enthusiasm the expansion of interest in originalism in recent years, but have noticed that there is no blog devoted to cataloguing and reviewing these developments. Hence, the Originalism Blog. The Originalism Blog, like many blogs, is intended to be a work in progress. Initially, the Blog will focus on three types of posts. First, we will be posting the abstracts of papers on SSRN that involve originalism. Second, in a feature called "Originalism in the Blogs," we will be linking to significant posts on originalism in other blogs. Finally, in a feature called "Originalism on the Web," we will be linking to pieces that discuss originalism in newspapers, magazines, and other sites. The Blog's ability to collect these materials is greatly enhanced through the use of students research assistants. Their names are listed on the side to acknowledge their contribution. While their work will often be indispensable, the final decisions of what stories or links to post on the blog will be made by the person listed as the author of the post. Needless to say, the Originalism Blog will be linking both to pieces that defend and attack originalism. The idea is to be a "one stop site" for those who are interested in originalism from any perspective. Over time, we hope to expand the postings on the blog. One idea is to include opinion posts by members of the Originalism Center and possibly by guest bloggers. Other ideas are being considered as well. For now, the opinions expressed are likely to come in the form of occasional and relatively short responses to the articles and posts that are linked to on the blog. We would like to give explicit thanks to two bloggers we have emulated in the design of this "resource blog." Anyone looking at the blog would recognize that we have borrowed some design ideas from Larry Solum's excellent Legal Theory Blog. Our hope is to be able to provide information about SSRN postings on originalism in the same way that Larry does more generally for postings on legal theory. Another inspiration, for our blog and web postings, has been the How Appealing blog published by Howard Bashman. That blog provides significant information about appellate law postings on the web and we hope to do that concerning originalism. If imitation is the sincerest form of flattery, then hopefully Larry and Howard will feel flattered. Finally, a brief word about the two pictures at the top of the blog. These two pictures involve the "two foundings" of the nation. 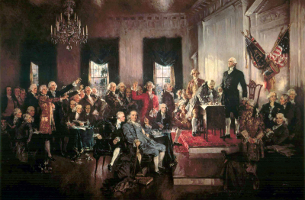 The picture on the left is Howard Chandler Christy's Scene at the Signing of the Constitution of the United States. 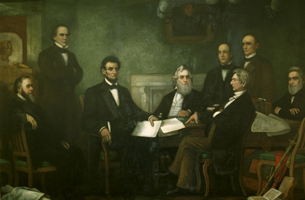 The picture on the right is Fancis Bicknell Carpenter's First Reading of the Emancipation of President Lincoln. The latter picture is not technically about the Constitution. It would have been better to have a picture involving the Reconstruction Amendments, but I could not find anything suitable.